This 17th Century classic folk poem is a form of trick poetry. It only makes sense if you change the arrangement and/or invert the sentences. I’ve never come across a poem set out this way before. I found it spectacular and challenging. What a wonderful way to teach children to approach, read, and appreciate poetry in its varying forms! Introduced as a mass of words that ‘reveal and conceal’, it is restructured to make sense by using cut out sections of the page in the shape of waves, circles, clouds, and lightning. These cut-outs portions project inside them, the words you should read to get the correct rhythm of the poem. This stunning book’s singular intricate black pen artwork boasts the artistic merit of the Gond tribe of artists of Central India. Their common art, full of colour and storytelling, reflects their close relationship to the natural world. The Gond history of cave paintings and use of colour, bear an interesting similarity to Aboriginal art. The eye-catching covers are in striking peacock blue, and ideally represent the first solo publication for award-winning, internationally acclaimed artist, Ramsingh Urveti. It is an accomplishment, for the Gond artists are known for creating work collectively, in order to gain a wide variety of colour, design and representation for their art. 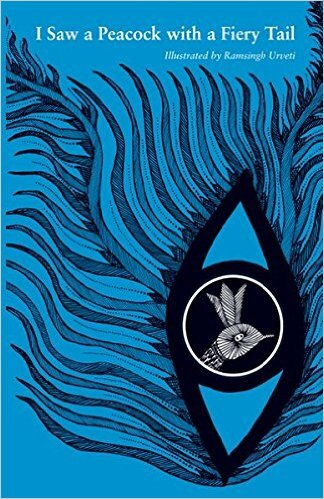 Beautifully presented by Brazilian graphic designer Jonathan Yamakami, I Saw a Peacock with a Fiery Tail is a collector’s must-have.